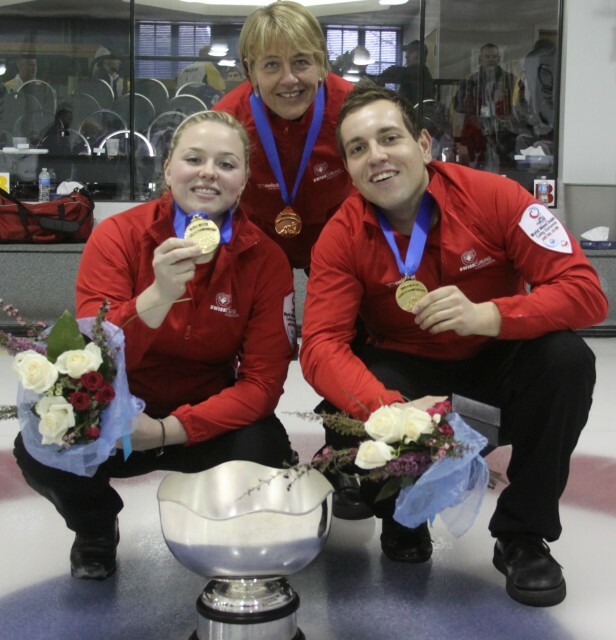 Switzerland won gold at the 2011 World Mixed Doubles Curling Championship in St Paul, USA beating Russia a resounding 11-2 in the final. It is the third Mixed Doubles world championship title for Switzerland in the four year history of the event. Alina Pätz and Sven Michel went through the championship on an unbeaten record, winning all their games in the round robin group, their quarter-final and semi-final matches. On the Russian side, it seems nerves had a lot to play. While Alexey Tselousov has represented Russia at the European Championships seven times, his teammate Alina Kovaleva has only been curling for 3 years. The Russian team, from St Petersburg, take the silver medal. Earlier on, Russia had beaten Sweden 9-7 in the semi-final of the event being staged in the St Paul Curling Club. Switzerland had beaten France 8-3 in the semi. Sweden went on to lose to France in the Bronze medal game 8-6. “We are absolutely delighted to have got so far. We didn’t expect to get on the podium,” said France’s Pauline Jeanneret who was playing with Amaury Pernette on winning the game. It is the first world championship medal for France since 1993. “As the week progressed we got better, to know each other’s game better and to know the ice conditions and have a better strategy. As the games went by our strategy paid off” added Jeanneret. -	Teams have only six stones each (instead of eight) - and one of those stones, from each team, is prepositioned on the centreline before each end of play starts.